Should You Buy a Custom Knife? Custom knives mean craftsmanship, high quality material, and artful designs. They also mean big dollars. Are you ready to hop into the world of custom knives? If you were bitten by the knife bug (in my case it seems that bug was a Dragonfly), you may have browsed around and seen custom knives. They have high prices, exotic materials, and limited availability. In the upper echelon of custom knives, you can pay five or six figures for a knife. But in the more sane price ranges, you should expect to spend between $500 to $1000 on a custom knife. Let’s dive into the world of custom knives. First, don’t expect performance to track price. Knives aren’t commodities. Unlike milk or gasoline, a ten fold price increase won’t get you ten times more stuff. Instead, a $1,000 knife might perform 10% or 20% better than a $100 one. You aren’t paying for steel when you buy a custom knife, despite the majority of a knife’s performance coming from the steel. Other than forged Damascus, you can get just about any steel you want in a production blade. Customs are more likely to have good steel, as there isn’t an incentive to cut costs. There are no 7Cr blades on customs. With a custom knife, you get a handmade piece of functional art. Knifemakers go about crafting each knife differently, but most custom knives are made nearly from scratch by a single person. What you pay for in a custom is a level of refinement. The grinds are crisp, the edges sharper, the handles more contoured. Someone toiled over this knife, so the results are a bit more polished. Compare, for example, the Jesse Jarosz M75 and the Kabar Jarosz 7075 in the photo below. Both are good at cutting, are sturdy, and have a similar appearance. But the M75 (top) is $500 and the 7075 is $50-$60. You can see that the handles and clip are more sophisticated on the custom on top. 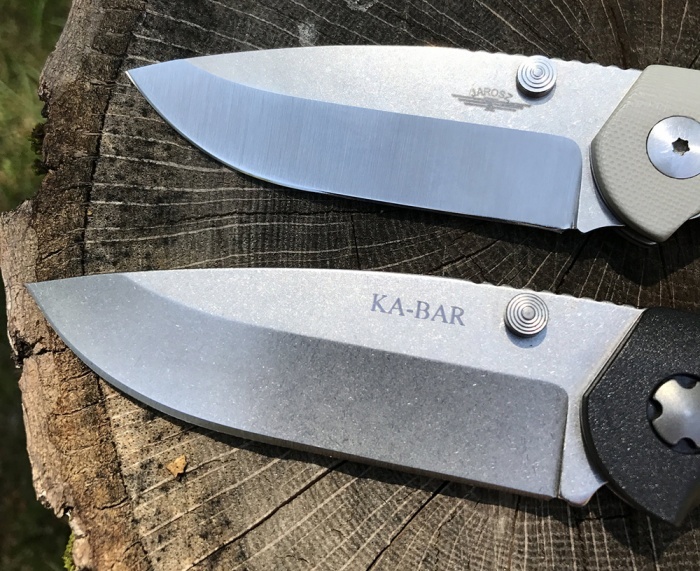 In fact, the Kabar runs molded scales and a stamped clip. The end result is a sharper edge to the handle and the clip, a less inviting blade for the hand. Also, compare the grind on the two knives. The custom on top has a grind that is sharp and bold throughout the entire blade. The production Kabar lacks this. Note also that the blade on the custom has two different finishes–stonewashed on the flats and grinder satin on the grind. The production is stonewashed throughout. 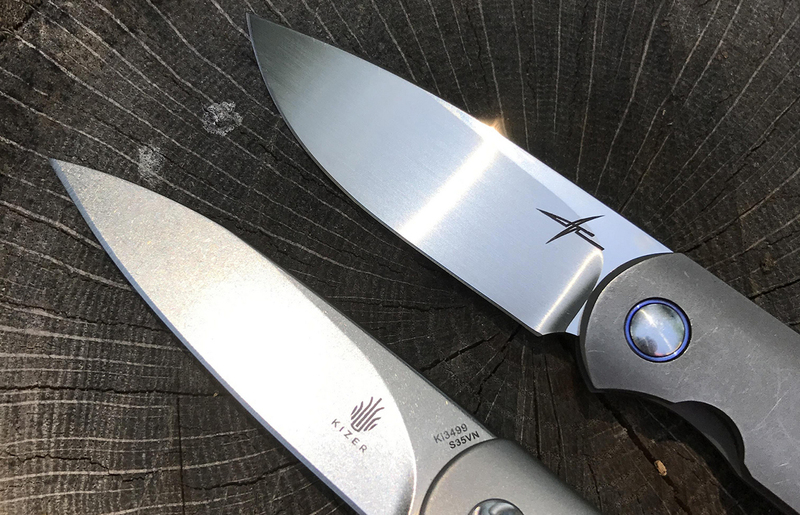 Even if you opt for a high-end production knife, which can match some of the refinement of a custom, you still can’t get a knife made just for you. With a custom knife, you get a blade designed to your specifications. 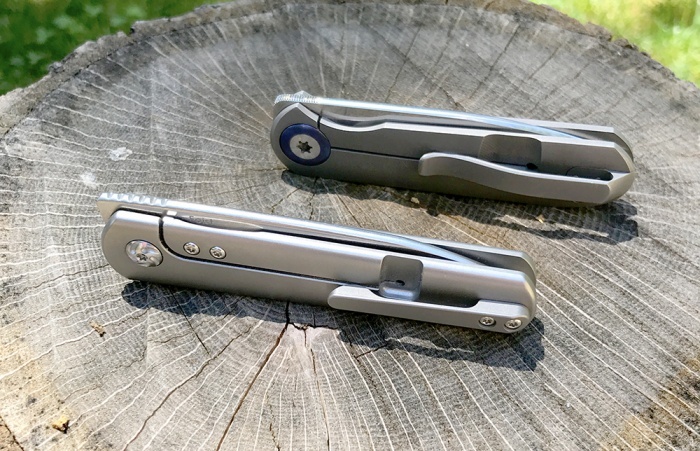 Compare the Gareth Bull Small Shamwari (top) to another front flipper, the production Kizer Feist. 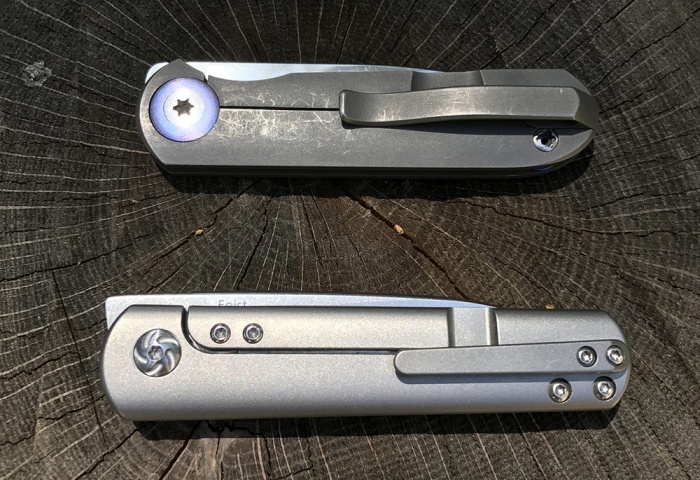 I was lucky enough to review a Gareth Bull Shamwari. 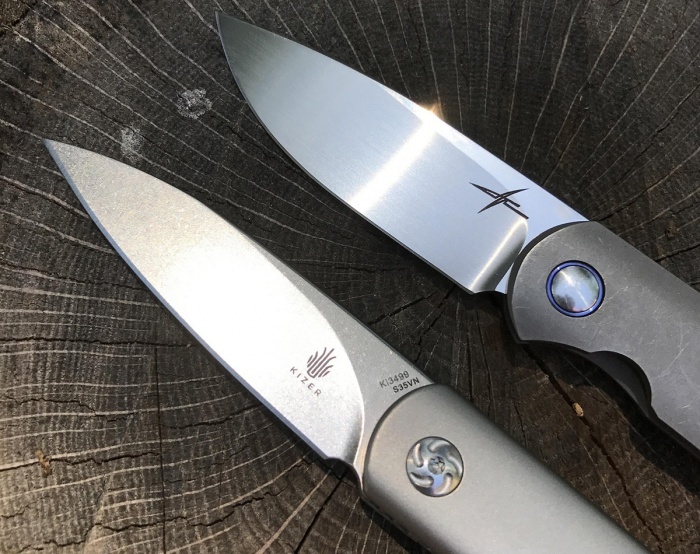 In response to my review, Gareth revised the knife and released the Small Shamwari (of which I received the first knife). The knife incorporates all of the changes I wanted. The result is a knife 100 percent perfect for me. For example, I wanted a sculpted clip (for comfort) with a deep carry (for discretion and to guard against loss). 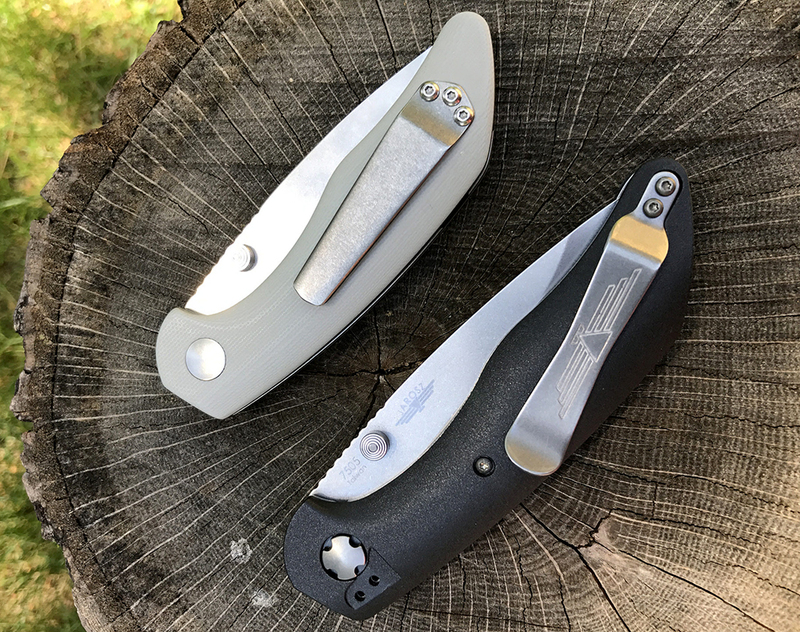 Gareth made that seemingly impossible request a reality with a clip far more unique than one on a production knife like the Feist. Customs offer a level of made-to-order features that a production knife cannot. If you are the kind of guy that knows a Timex Weekender will keep good time, but you prefer a Rolex instead, then a custom knife is for you. Those who count pennies or only care about cutting performance will find a production blade suitable. The picky who want a knife exactly as conceived in their head should consider a custom.